Partly cloudy skies early will give way to cloudy skies late. Low 48F. Winds N at 10 to 15 mph.. Partly cloudy skies early will give way to cloudy skies late. Low 48F. Winds N at 10 to 15 mph. Often — too often — elderly people don’t fare well in print. In novels or in the news, elderly men are characterized as cranky but eventually lovable (remember Ove? ); their female counterparts are crabby or, worse, feisty. This isn’t true of Doris Alm, the 96-year-old central character of “The Red Address Book,” by Sofia Lundberg. Doris is old and she knows it. She lives in Stockholm, her only company her visiting caregiver, and her only family a niece, Jenny, who lives half a world away in San Francisco. They talk regularly through Skype, but Doris knows that she can’t travel to visit and Jenny is occupied with her young family. Doris is alone. But when Doris is hospitalized after a fall, Jenny travels with her daughter to Sweden, knowing that this will be the last time she spends with her beloved aunt. There, she learns about the address book that Doris has kept since her childhood and about the people whose names — crossed out and labeled “Dead” — appear in the book’s pages. Lundberg has structured Doris’ story around the address book and Doris’ memories of those names and their role in her life. And what a life this unassuming old woman lived! After her father’s early death, Doris’ mother sends her to be a maid in the home of a woman who entertains various creative types, including Gosta Nilsson, a struggling painter who will remain a lifelong friend to the shy little maid. From Sweden, Doris goes to Paris, where she becomes a fashion model, a career that will end when her mother dies, foisting her to take over the care of her younger sister. In Paris, Doris meets the love of her life, but he disappears, returning to the United States to care for his mother. And world war intervenes, keeping the lovers apart. Through the address book and Doris’ stories, Jenny learns how Doris and her sister, who would become Jenny’s mother, managed to make the trip to America, where they learned that Allan, her lover, has returned to Europe. Again, fate has conspired to thwart a happy ending for the little maid. 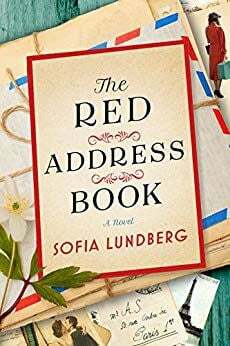 Translated from the book Swedish by Alice Menzies, “The Red Address Book” has been a best-selling book in Sweden and throughout Europe before finding a spot on the best-seller lists in this country. It is a brief book and deeply sentimental, but it testifies to the value of friendships and of letters (imagine a world without email! ), of memories and of keeping one’s counsel, rather than airing one’s life on television and social media. “The Red Address Book” is a small book, but a sweet book. It’s enough. This looks like an awesome resource. I hope that many do take advantage of this. Highlights of our community's growth, changes and what our future holds. Ask Jessie: Where are we supposed to park? Do you support the Kansas Legislature to approve medical marijuana use in Kansas?